The Mission Statement of New Earth Theological University is to facilitate interspiritual academic studies and foundations for leadership and service in creating a world of justice, peace and dignity. 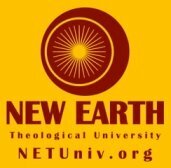 New Earth Theological University is a spiritually diverse, new-paradigm educational community building excellent progressive foundations for leadership, teaching, ministry and service. School of Interspiritual Studies facilitates unique graduate and postgraduate interspiritual studies in a broad range of creative academic disciplines, directing the general and interdisciplinary educational programs. NETU Seminary with its integral philosophy of Reinventing Seminary, provides online seminary courses of study designed for students preparing for ordination in particular faith and interfaith communities. With a post-modern theological framework of Oneness we feel it is cutting-edge. School of Anthropology & Sociology of Religion - ASR is an interspiritual and interdisciplinary research, education and advocacy institute dedicated to addressing practical and theoretical questions arising from the integration of interspirituality in the global community. If you have been guided to pursue a powerful dream of achieving quality higher education, NETU has exceptional professors, advisors and teachers offering very affordable curriculum leading to a Masters Degree in Divinity; a Master of Arts in Religious Studies; and a PhD program in Religious Studies. Thank you with heartfelt blessings for your interest. Have courage to follow your dream; you can do it. Apply today and empower your life through advanced and meaningful course programs of study. Follow your heart-of-hearts and achieve what you've always felt guided to do. Click (the blue contact tab, left) for more info on NETU, one of the finest new-paradigm schools. May your studies at this top online university bear fruit for all sentient beings!